My Mum always says that a hot April makes for a wet summer. If she's right, then we are in for an absolute downpour. Over the past few days, London's parks have been chocca with dizzy, vitamin D-deprived city dwellers getting their fix after so many months of cold, grey weather. Spring is in full swing, and I could not be happier. With Easter just around the corner, I've felt so inspired by all the gorgeous new season produce that is coming to market. 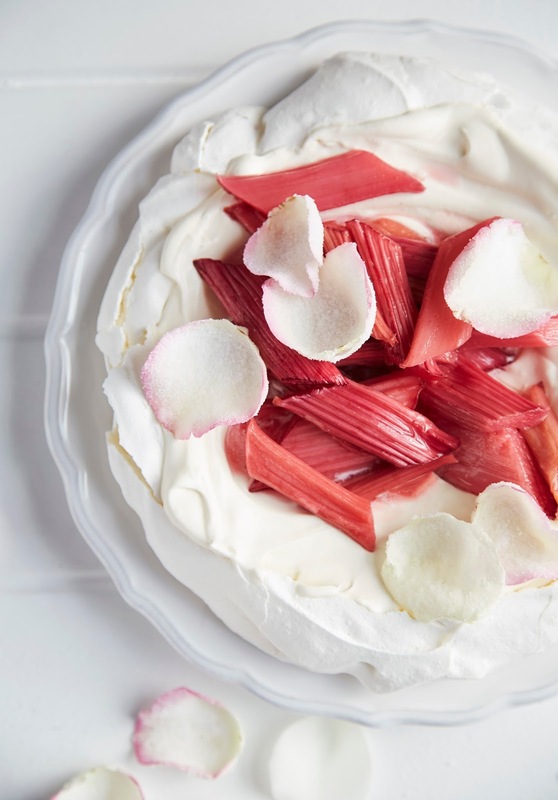 This pavlova makes use of early outdoor rhubarb, which is tangier and more robust than the forced variety that grows over the winter. 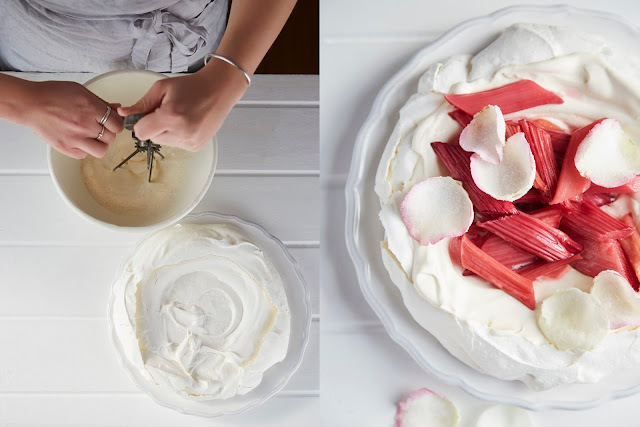 Rose water marries perfectly with rhubarb, and adds a floral note that is perfect for Easter. I don't know about you, but I often find that Easter sends me in into chocolate overkill. It can be nice to have something a little fresher, lighter and fruiter after a heavy family meal. 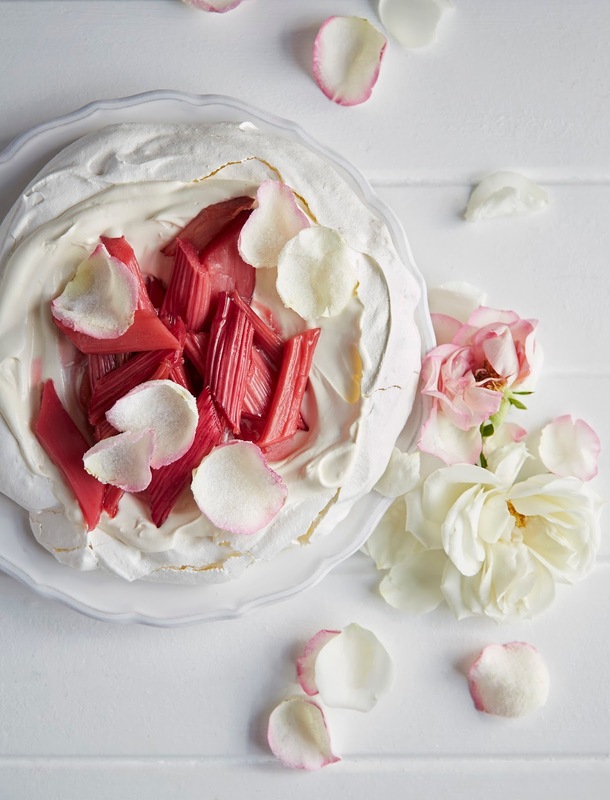 You can make your own crystallised petals, or decorate the pavlova with fresh edible flowers. Gorgeous photos by Luke Albert. Heat the oven to 160°C / 140°C fan. Line an ovenproof dish with foil. 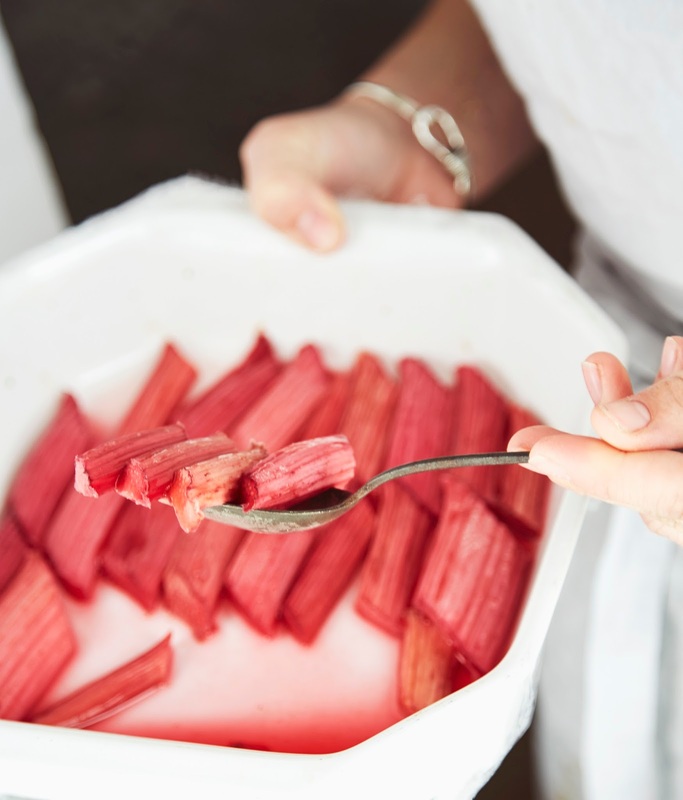 Slice the rhubarb into 4-5cm batons, trimming off the ends. Arrange in the lined dish, then sprinkle with 50g of the caster sugar, the vanilla and 2 tsp of the rose water. Cover with a second sheet of foil, and roast in the oven for 20-30 minutes until the rhubarb is soft. Don't overcook it, or it will fall apart and loose its shape. Lower the oven to 140°C / 120°C fan. Line a large baking tray with baking paper. Whisk the eggs whites to stiff peaks in a stand mixer or with an electric whisk. Add the remaining 200g caster sugar, one tbsp at a time, whisking after each addition before adding any more sugar. The sugar should be completely dissolved, and a little meringue rubbed between your fingers should not feel grainy. Add the cornflour and lemon juice, whisk briefly to combine, then turn the meringue out onto the lined baking paper. Spread into a circle, making a slight dip in the centre. Place on the bottom shelf of the oven. Bake for 1 hour - 1 hour 30 minutes. 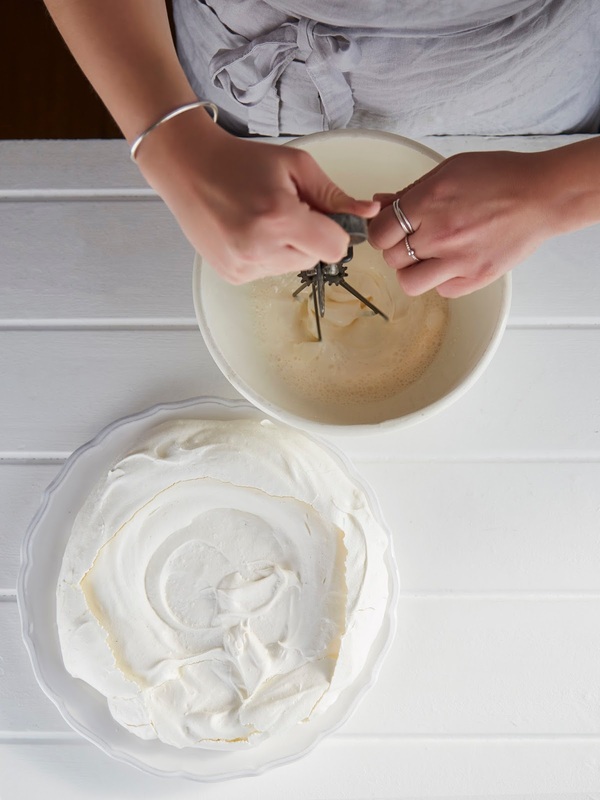 The meringue is done when it can be lifted off the baking paper at the edges. Turn the oven off, leaving the meringue inside to cool completely. This will allow the meringue to cool down gradually, and for the centre to become soft and mallowy. When you are ready to assemble the pavlova, place the cream in a large bowl. Add the icing sugar and 1 tsp rose water. Whip until the cream is thick and pillowy. 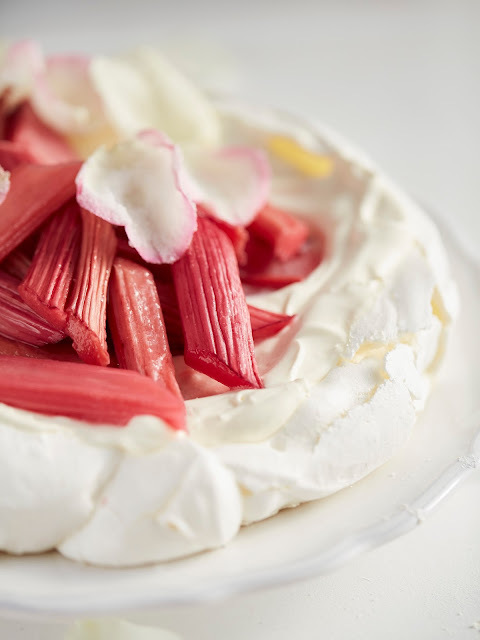 Spoon the cream over the pavlova, then top with the roasted rhubarb. Decorate with crystallised rose petals or fresh edible flowers. What an idea.....This is a very useful and informative article.I was wondering for this information .Very helpful post , it has helped me to understand many things . Always love your resource. Hope that they will provide a good lecture on the subject.Thank you so much for writing it. I would like to show because of you merely for bailing me out of the particular trouble.Due to checking through the web and get together techniques which were not beneficial, I thought my entire life was done. looking for birthday wishes for your family or friend you should visit once time. Such intelligent work on the subject and ideal way of writing here. I am really impressed!